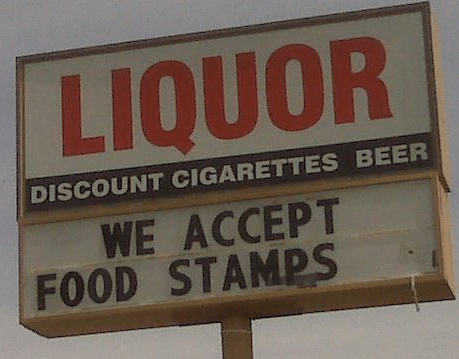 The Libertarian Case For Welfare Cheats | Dude, Where's My Freedom? Generally speaking, libertarians are almost universally opposed to any “social welfare” or wealth redistribution programs. We consider them to be impractical, economically inefficient, and an unjust violation of property rights. If it were up to us, all of these programs would be abolished. They simply would not exist. Unfortunately, it isn’t up to us. They do exist. We’re stuck with them, for now at least. Given that they exist, I have a question for libertarians to ponder: Is it immoral to “cheat” these programs? Does it detract from our societal wealth economically if people do so? I’d like to propose that the answer is no. This might sound like a very strange position indeed, coming from someone who thinks the programs are bad and should not exist. While I find these programs immoral and would in fact abolish them if I had the opportunity, at the same time, I’m completely at peace with those who take advantage of them, game the system, and even engage in blatant fraud to obtain benefits they are not eligible for. Why would someone who favors the non-aggression principle support the collection of monetary benefits by fraud? Because the alternative is surely much worse. Think about it for a second. Consider some lazy individual who just plain doesn’t feel like working, and comes up with a scheme to successfully collect a bunch of benefits they shouldn’t necessarily be receiving. What is really happening here? Tax money is being transferred from the government to an individual. Most likely an individual of limited means who will likely spend that money on goods and services. This is an economic boon. If the individual decides not to engage in this scheme, what happens? The government keeps the money. It doesn’t return it back to the taxpayers who provided it. The welfare cheat is not stealing “our” money. It ceased to be “our” money as soon as the government stole it from us. If I had the opportunity to choose, I would much rather have my money taken from me and given to a random individual than kept by the government. The individual is almost certainly going to buy relatively benign items with it. The government is going to spend it on wars, policemen, NSA agents, and other such things that advance its own power and actively disrupt and diminish my quality of life. The fact that I would most prefer to have the money returned to me is not relevant in this discussion, because that option isn’t even on the table here. From a legal standpoint, the government has been quite clear on this. It collects money from you in taxes, then, in an entirely separate role and function, spends some of that money on social welfare programs. But regardless of what any particular tax is named, these are completely independent functions that have nothing to do with each other, legally or practically. This makes it clear that the welfare cheat is not stealing money from you and me. He is stealing it from the government, who itself stole it from you and me. Since I would rather see my money go towards individuals than to a power-mad bureaucracy, this is not an action I can get upset over. Rather, it is a simple case of what’s good for the goose being better for the gander. This entry was posted in General Theory and tagged entitlement, fraud, government, libertarianism, social security, supreme court, Taxes, welfare, welfare fraud, welfare state. Bookmark the permalink.